A 1950's image of St Mary's Church, Devonport, courtesy of Gerald Barker,  since deceased. During the mid-1800's several new parishes were formed in Devonport, all stemming from the mother parish of Stoke Damerel. St Mary's ecclesisastical parish was sanctioned in 1846; it was centred around Dock Wall Street (which became Edinburgh Road) and James Street, where St Mary's Church was subsequently built. The first Reverend of the parish was Reverend T C Childs who lived at the bottom of James Street. From the moment the parish was formed Reverend Childs worked constantly to provide both a church building for the community and church schools for children. His first establishment was a temporary school in Granby Street; the second was an infants' school built at the rear of his residence in James Street. The third was another infants' school at Doidge's Well, an alley off James Street. In attempting to raise funds for a church the Reverend Childs wrote various pamphlets and offered them up for sale. 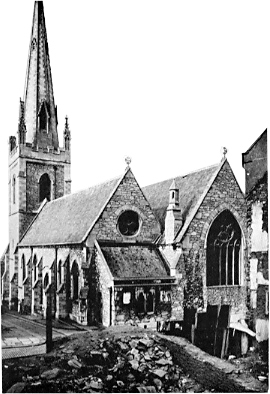 His 1849 pamphlet was published by Plymouth Trinity Church; it listed the subscribers to date, the sums they gave, and appealed for more subscribers to St Mary's Church. Within his plea for more subscribers Reverend Childs described the terrible conditions in St Mary's district, "... 46 public houses, 34 notorious houses, and in one there were found 111 souls ...". Whilst many records from that period attest to those exact conditions in Devonport, once the church was built, several members of the congregation lived in Ker Street, which was (then) an up-market part of Devonport. By 1850 sufficient funds had been raised, by subscription and grants, to begin building St Mary's Church. The foundation stone was laid this year by Edward St Aubyn, and the construction was to a design by his relative, James Piers St Aubyn. In the early part of 1853 the Granby Street school was moved to rooms underneath St Mary's Church, with a Mr J Wonnacott appointed as master. Sources differ slightly in their descriptions, on the cost of build and the height of the tower mostly. Wladyslaw Somerville Lach-Szyrma, who lived in Ker Street, became a Sunday school teacher at St Mary’s,  under the incumbency of Rev. Alfred Swain who prepared him for confirmation. In 1857 at the age of 16, Lach-Szyrma began reading the lessons to St Mary’s congregation. He had shown a liking for Church history & philology from an early age, and went on to be ordained into the priesthood. The Reverend Franklin Alexander Straham Bellamy was the minister in 1869. For a listing of churchwardens in this year see Plymouth & West Devon Record Office, Ref 2155/25 2a, and 2b. The next image next shows the women's choir of St Mary's Church  . 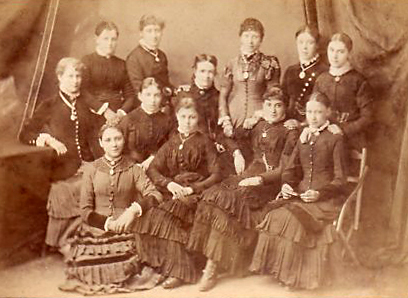 Their clothing/fashion dates this photo to the period between 1880 - 1884. Unfortunately their names are unknown. The Reverend George Anselm Bennett was the incumbent vicar for 31 years, mostly during the 1930's and 40's and up until the early 1950's; he ran both a Scout Troop and Cubs Pack, which met in the large cript below the church. Reverend Bennett was loved by the community  and upon his death about 400 residents petitioned for his recognition by the city - in consequence Bennett Street in Devonport was named after him. 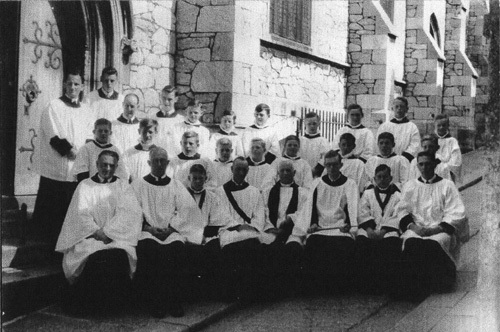 Here is an image of the August 1949 male choir of St Mary's, kindly sent in by reader Paul Boundy. Paul attended this church himself during his post-war youth in Devonport; his brother can be seen in the choir, second from right in the front row. If any other readers recognise their image and name (listed below) it would be good to hear from you. Both Barker and Moseley mention that strenuous efforts were made, around 1956-57 to save the Church from demolition, but it was not to be. In 1959, along with four other churches in Devonport, St Mary's Church was demolished; their parishes merged with St Aubyn parish. The incumbent at the time was the Reverend JH Jones (wrote Gerald Barker), and Henry Gendell (seen in the male choir image above) was one of the objectors to the demolition of the church, on the grounds of its history, structure and ecclesiastical beauty. Personal and written communications with Gerald Barker, since deceased, in August & October 2001. The author purchased this photo from an Ebay auction in April 2011. Gerald Barker. Days in Devonport. Part II, pages 22-23.